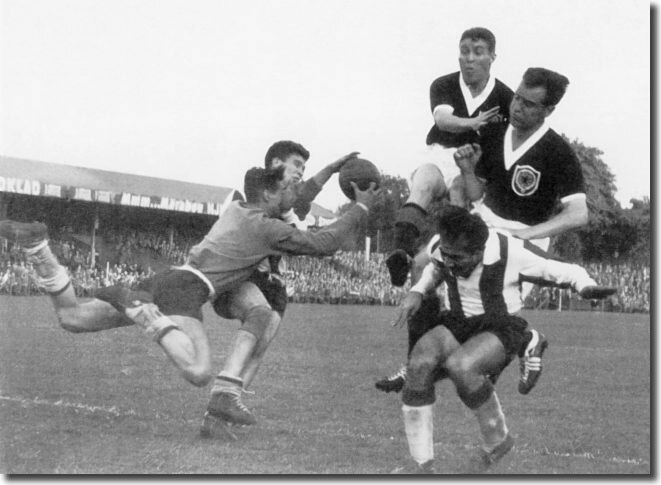 Despite Argentina, Chile, and Mexico, expressing interest in hosting the tournament, the sixth staging of the 1958 FIFA World Cup TM, was awarded to Sweden. The motion passed unopposed. Sixteen teams from 3 confederations took part with Sweden (the host) and defending champions (Germany FR) with 10 allocated to Europe (Austria, Czechoslovakia, England, France, Hungary, Northern Ireland, Scotland, USSR, Wales and Yugoslavia ), three to South America (Argentina, Brazil, and Papaguay), and one to North Central Caribbean (Mexico). 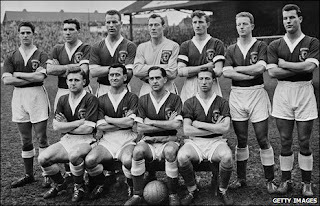 Three teams made their first World Cup presentation (Northern Ireland, Soviet Union and Wales), and all got as far as the quarter-finals. Twelve cities were chosen throughout central and southern parts of Sweden: Stockholm - Råsunda Stadium (8 matches) , Gothenburg – Ullevi (7 matches) , Stadium, Malmö – The New Malmö Stadion , Helsingborg - Olympia, Eskilstuna - Tunavallen , Norrköping - Idrottsparken, Sandviken - Jernvallen, Uddevalla - Rimnersvallen, Borås - Ryavallen, Halmstad - Örjans Vall, Örebro - Eyravallen, Västerås - Rimnersvallen. The Soviet Union took part in the competition for the first time and all four British teams qualified for the final round. Argentina appeared for the first time since 1934 but Italy, Uruguay, Spain and Belgium all failed to qualify . The 16 qualifying teams were split into four groups of four, and each team played each of the other teams in its group at least once, without extra time. Two points were awarded for a win and one point for a draw. 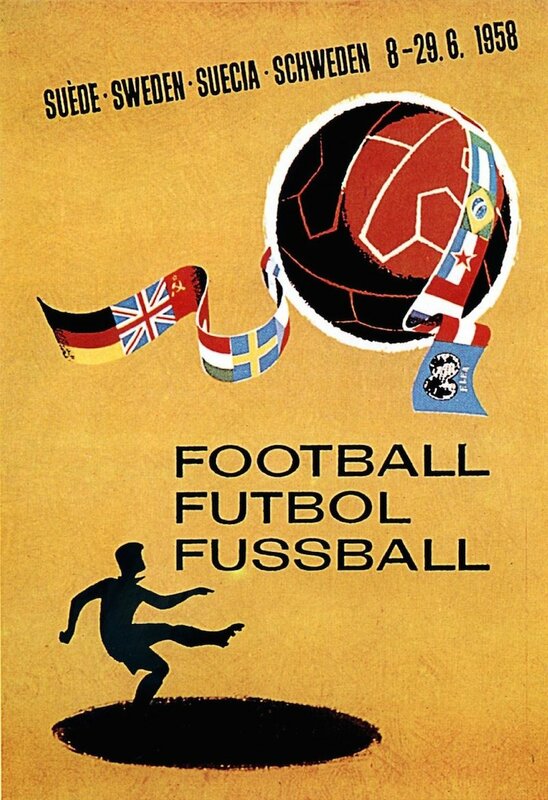 Seeding was geographical rather than by team strength, with each group containing one western European team, one eastern European team, one of the four British teams that had qualified, and one from the Americas. Another first was in the event of two teams tying for first place with equal points, then goal average would decide who was placed first and second. When the second and third placed teams finished on the same points, a play-off would decide who would go through. In all cases, three playoffs finished with decisive results circumventing the need to apply the new and unpopular rules. The best two teams of each group moved on to the quarter-finals. Prior to the tournament starting, England lost three key players, when they perished in the Munich air disaster on 6 February 1958. On the plane was the Manchester United football team, along with supporters and journalists. 23 of the 44 on the aircraft died. To allow the Swedes to attend other matches, Sweden's three group matches were held at a different time from the rest. Otherwise. 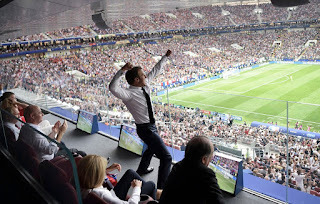 all the other matches kicked off simultaneously in each of the three rounds of the group phase, and the quarter-finals and semi-finals. Only one match per round was televised, and relayed across Europe by the European Broadcasting Union (EBU). This was the first event televised to over 60 countries, but not in Eastern Europe because the system there was incompatible. 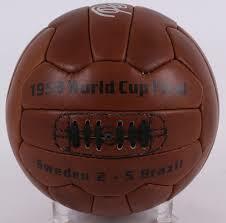 Many Swedes bought their first television for the 1958 FIFA World Cup TM. A total of 819, 810 spectators attended and 126 goals were scored (3.60 per match). The top goal scoring honours (13) went to Just Fontaine (France), and scored 13 goals in 6 matches. 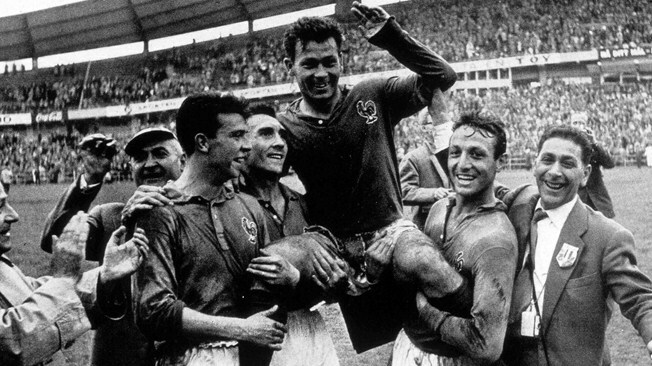 Just Fontaine became the second player after Alcides Ghiggia to score in every match of a World Cup. 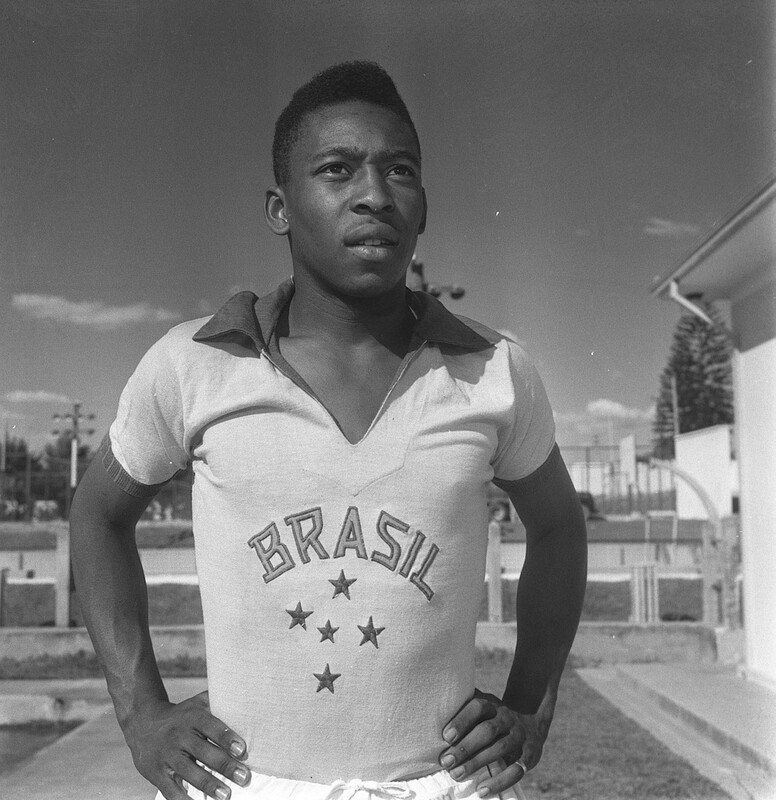 Both himself and Pele (hat tricks) netted hat tricks. 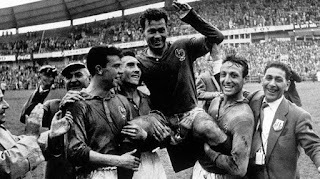 Until this time Just Fontaine, had not been a regular first player for his national team, yet he became the top scorer of the tournament. Bobby Collins (Scotland) scored the 500th goal of the tournament in Scotland’s game against Paraguay. Scotland were beaten 3 -2. 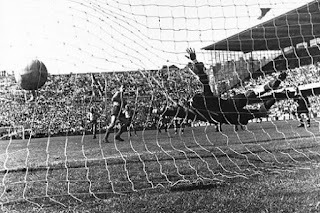 When England and Brazil drew 0–0 in Gothenburg on 11 June 1958. 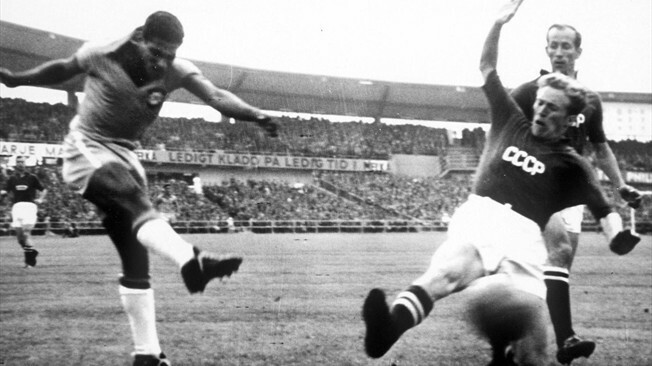 This was the first ever goalless draw in a World Cup match. The official ball was the "Top-Star VMbollen 1958" model made by Sydsvenska Läder & Remfabriks AB (aka "Remmen" or "Sydläder"). It was chosen from 102 candidates in a blind test by four FIFA officials. Brazil’s manager and couch, Vicente Ítalo Feola, introduced the 4-2-4 system of play. i.e. four defenders, two midfield runners and four forwards. This was a refinement of the Brazilian "diagonal" system, and first put into practice by FC São Paolo and FC Santos. 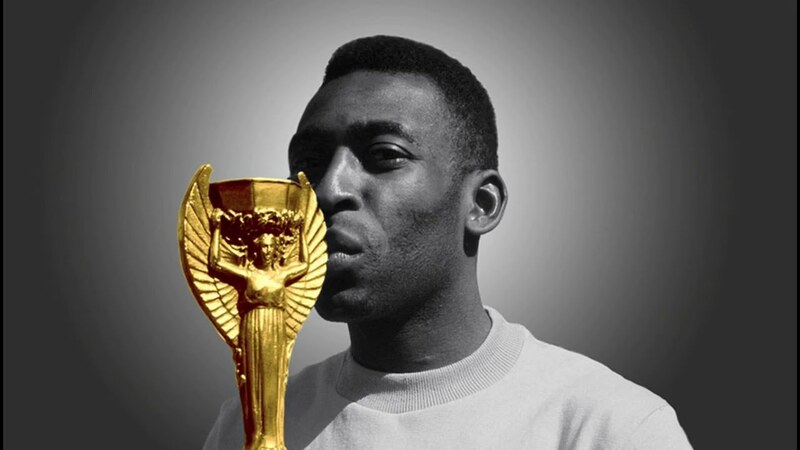 He also introduced Edson Arantes do Nascimento, better known as Pelé, who at the age of 17, not only made his World Cup debut as the youngest player ever but scored twice in the finals. 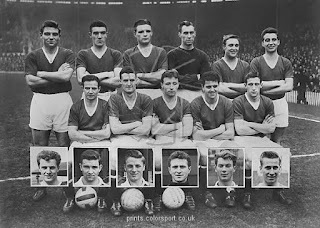 Feola’s ‘Wonder Team’ had a wealth of great attacking players. But had to adjust quickly to the more physical characteristics of the Europeans, without sacrificing their own special strengths. The 4-2-4 was tailored to suit the abilities, the mentality, the temperament and above all the peculiarities and special skills of the Brazilians. After the 1958 World Cup, the 4-2-4 was adopted by many other teams. The 1958 FIFA World Cup Final FM was between the hosts, Sweden and Brazil was held at the Råsunda Stadium, Solna in front of 49,737 spectators. Brazil defeated Sweden 5-2, including two goals of the incomparable Pelé, This final had the highest number of goals scored by a winning team (5), the highest number of total goals scored (7); the greatest victory margin (3). In 2002, Sveriges Television a produced a mockumentary directed by Johan Löfstedt, entitled Konspiration 58. The plot suggests the 1958 FIFA World Cup in Sweden had not actually taken place. 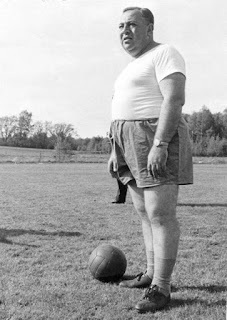 but instead was faked in a conspiracy between American and Swedish television, the CIA and FIFA as part of the Cold War. The aim of the film, was to illustrate how historical revisionism worked and to highlight the importance of source criticism when getting information from the media. The majority of the characters featured in the film were real celebrities and the audience were not forewarned what they were about to see was a mockumentary. It had a very mixed reception when first shown. Russia commemorated the 6th World Cup Soccer Championships, with the 1958 release of this set of two stamps. Russia is highlighted on the globe.